This looks like three different illustrations cut and pasted together. Doesn’t look like the standing characters are even aware of each other. Oookay… so I’m looking at Merlin the Magician and Sinbad in a Mexican Standoff against a very short woman who’s armed with the mother of all joy-buzzers. Where exactly does the “Stolen Throne” enter the picture? – It’s under her skirt! – No! It’s behind Merlin! – It’s a tiny throne hidden inside the helmet! They really nailed that ‘photoshopped’ look that’s so in right now with this one! It takes a special kind of talent to make an illustration look fake. No, you’ve got it all wrong. 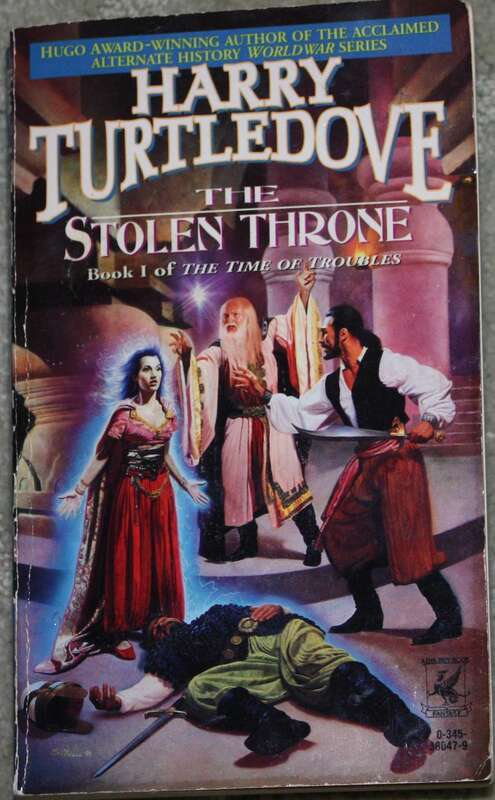 The woman stole the throne out from under the collapsed fellow, and is fruitlessly protesting her innocence despite the white glowing force field around the two of them. I think they’re playing musical statues and the music has just stopped. The guy on the floor is cheating. Man, there are a lot of fingers in this illustration. Stephen Youll once again shows he is the master! Agree about the cut & paste possibility though, trouser fabric on Floor Man is far more detailed than on Pantomime Swashbuckler. Love this site. This is where I come when the rest of the internet stops making sense. Note how LOW the losses are! That’s the logical reason why publishers can afford to print lousy covers. Maybe the readers are jaded. I appreciate the subtle Christmas theme here (‘four calling birds, three French hens, Harry Turtledove/And a partridge in a pear tree’). Bravo! Man, can Halloween Costume packaging get any more dramatic? Clearly they’re playing Charades- the original, fancy kind featuring costumed tableaus, popular with the European upper-class in the 19th C. I’m not sure what syllable this is meant to convey, but it doesn’t really matter, because after this scene the characters will change back into their normal attire and resume fighting the Alternative Crimean War against the Russian lizard-troops. Is it just me, or is Glowy Girl levitating dead guy? Looking at the feet and hand shadows, he doesn’t seem to be touching the ground. Was she trying to beam out with the corpse/evidence before Merlin and Sinbad came in? @GSS ex-noob. Well, the glow’s spreading over the corpse, so possibly.